Casino.com is one of the more sophisticated online casino brands on our recommended list of New Zealand casinos and is the ideal casino for Kiwis looking for something more straightforward and professional. The overall look of the casino is classy and the user interface is simple and clean, making getting to the pokies you love quick and easy. Casino.com is owned by the well-known Mansion Group and was launched in 2008, running exclusively on Playtech software, this casino is all-business and carries over 300 of the very best pokies around. Kiwis can enjoy bonuses and banking in their own currency as well as extensive, 24/7 customer support and ongoing promotions to keep things interesting. The Playtech brand is one of the most recognizable and most respected brands in the online casino industry and Casino.com offer a selection of some of the finest pokies that this long-running brand has ever produced. There are well over 300 Playtech games to choose from, with the lions share awarded to some of Playtech’s most successful pokies ever. Kiwis can enjoy play Playtech pokies with an RTP of over 96% as well as range of high to low volatility games. Playtech offers something for all tastes and needs from low and steady payers all the way up to massive paydays that are worth waiting for (and spending money on). Among the most sought-after Playtech pokies are their massively successful Marvel Comics Series, tied in to the Marvel Mystery progressive jackpot network. Marvel Mystery pokies offer 4 different progressive jackpots is a single pokie, providing plenty of jackpot winning opportunities. Some of the Playtech pokies available at Casino.com include: The Incredible Hulk, Iron Man 2, Spider Man: Attack of the Green Goblin, The Avengers, X Men, Daredevil, Elektra, Iron Man and Fantastic Four. Kiwis can also enjoy a competitive range of other casino games including a range of table games like Roulette, Blackjack, Craps and Baccarat. Casino.com also offer a Playtech-powered Live Dealer casino with live versions of Roulette, Baccarat, Poker and Blackjack. The casino is available as a full download, browser-based Instant Play or as a mobile platform. The Casino.com Welcome Bonus package is quite impressive and adds up to $400 cash tour deposit plus 200 free spins, the first 20 of which are no deposit. This initial cash boost into your account is a great way to get a running start at some of the many Playtech pokies on offer. The free spins are given out 20 at a time, 20 on your registration, 30 after your first deposit and 20 more each day for 8 days after your first deposit. Each time you have must log on and claim them during that day and use them within the 24 hours. There is a maximum $100 cashable winnings on the free spins and they must be played through 20x. Bonus quality – Our thoughts: The Casino.com Welcome Bonus package is pretty decent and is great for NZ pokie players. The slight downside to the offer is the maximum $100 winning on the free spins and the 40x wagering requirement on the bonus money, although it is fairly standard for such an offer. Add to this the fact that Casino.com do not count much, if any, of their table games, card games or video poker towards the play through requirement makes it a bit harder for those Kiwis that don’t like playing pokies as much. 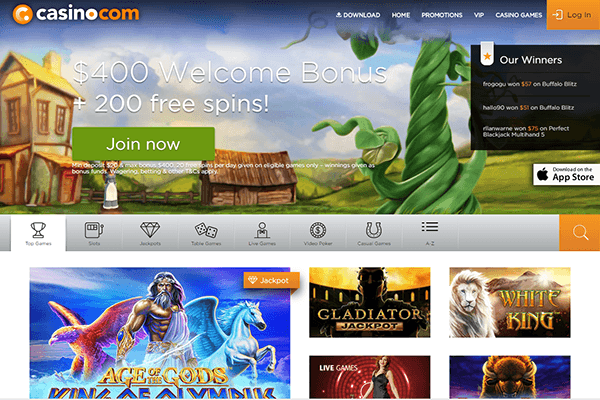 The Casino.com mobile platform is ideally suited for iOS and Android smartphones and tablet devices. Each operating system has a dedicated app which users can download, either from the casino’s main site or from their relevant app store. The brand’s mobile platform can also be enjoyed by non-iOS and Android users and Blackberry or Windows Phone users can simply access the casinos mobile site via their HTML5 enabled mobile browsers. Although the Casino.com mobile casino platform is slightly more limited at this stage when compared to some of the other top online casinos for New Zealand players, it still manages to offer a decent range of Playtech’s best pokies including several Marvel Comics progressives, a few table games including Roulette and Blackjack and some Live Dealer games for good measure. Casino.com players can also enjoy additional mobile bonus offers and the same banking options that the desktop version provides. The Casino.com promotions vary and include weekly and monthly promotions as well as on going and fun promotions such as the ‘Jack Potts’ promo which involves Casino.com players keeping an eye out for the casinos elusive mascot who will show up randomly during games. Any player that successfully spots the mascot can win an instant prize. 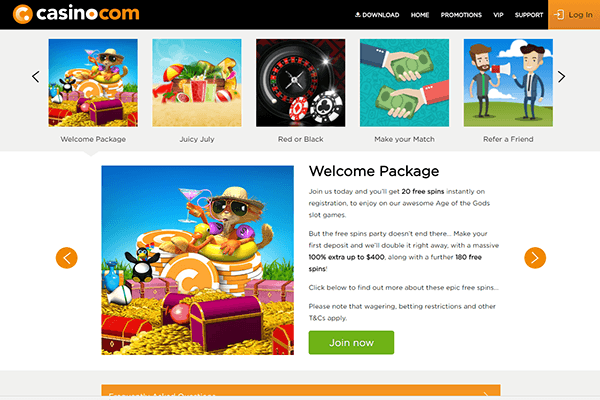 The casino also offers a solid Casino.com VIP program comprised of several levels starting with a bronze level and extending all the way through to VIP and the ultimate, VIP Elite. Each level offers a different range of special promos; prizes and added rewards which can include exclusive reload bonus offers, spot prizes, invitations to exclusive events and big prizes including vehicles and holidays. Payment methods available at Casino.com are fairly flexible and allow for a number of different options to suit most preferences. Kiwis can enjoy banking in NZD through preferred methods including PaySafeCard, Neteller, Instant Banking and credit/debit card options. The initial withdrawal process is fairly convoluted and requires various types of identification including a driver’s license and utility bill to be emailed through to their accounts department. This process can take up to 72 hours but once this has been verified withdrawal times become somewhat faster. 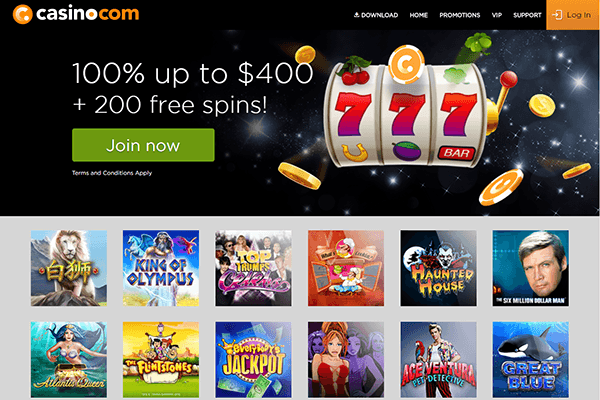 Casino.com is quite aptly named since it does its very best to offer a one-stop shop for Kiwi pokies fans. The brand offers a sophisticated user interface that is free from clutter and getting to the games that are important to you is very quick and easy to do. While banking and the mobile platform are somewhat more limited than some of the other casino options on our list of recommended casinos for New Zealand players, we still feel that on an overall, this brand offers everything most serious players are looking for.